28W 2D High Frequency 2D Bulkhead (Emergency Version) with chrome base and an opal diffuser. This fitting is IP65 rated, which means that this fitting can be used outdoors. 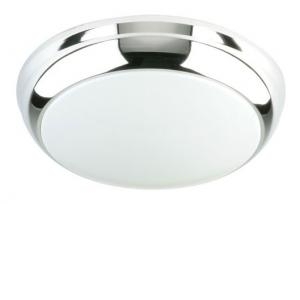 Typical applications include, corridor lighting in offices, schools e.t.c; corridor and ceiling lighting inside flats and student accommodation, or outside applications, like wall mounting these 2D round drum style lights on the sides of buildings, to enable walkway and path lighting, as well as providing security lighting in remote areas.